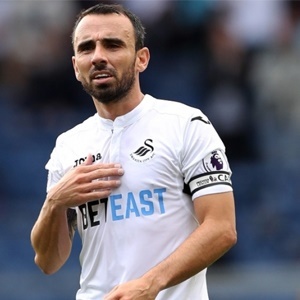 Cape Town - Veteran midfielder Leon Britton has relinquished the Swansea City captaincy to take up a coaching role at the Premier League club. The 35-year-old, who has made four league appearances this season, replaces Claude Makelele as part of the Swans' backroom staff. Makelele had served as head coach Paul Clement's assistant, but accepted an offer to manage Belgian top-flight outfit KAS Eupen last week. Britton will continue to be available for Clement's side, but has handed over the armband to focus on his new post as player-assistant coach. "It is the beginning of a new chapter in his career," Clement told the club's official website. "I feel he is the perfect person for the role at this time. "He is still very much in my plans as a player, but now we can tap into his knowledge as a coach too. He has a lot to give in that respect. "He now sits in on all management meetings and on the days where he is not training, he will be part of the coaching set-up. "Similarly, on a matchday, if he's in the squad then his focus is on playing. If not, then he will be in the dugout as part of the coaching staff."